It’s Thursday morning, and I need to hit the road and reach my day job. I have a few minutes to spare, and I look outside. Snow flurries. Light, fluffy snowflakes drifting in the air like ballet dancers to a Vince Guaraldi soundtrack. I look at my watch. I have a few minutes. Let’s get the camera gear and capture some snowflakes. Nikon Df at the ready. 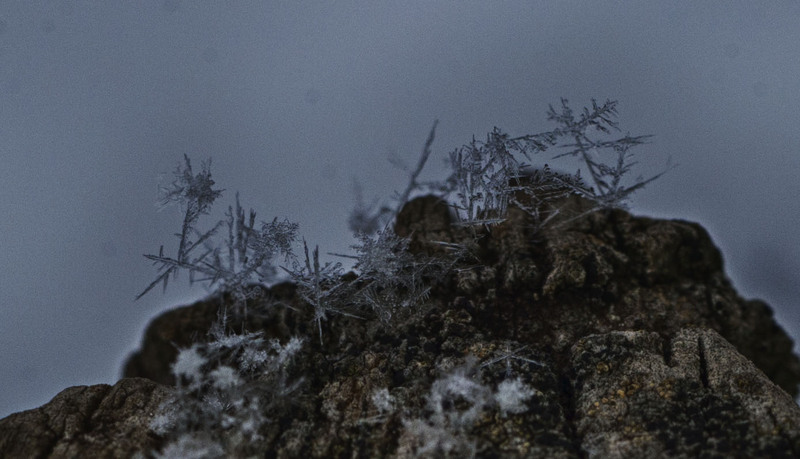 I grabbed my vintage 55mm 1:3.5 macro lens – snowflakes are small, you need to capture them with a macro lens to get their beauty. I also wedged a ring flash around the lens; I purchased an LED ring flash online months ago and never got around to using it. Silly me. I went outside. Normally one would capture snowflakes by leaving a black cloth outside, letting the snowflakes settle on the cloth, and photographing them as they rested. Yeah, that would have worked had I left the cloth out earlier in the morning, so that the cloth would be as cold as the outdoors. Unfortunately, the snowflakes that did settle on my black cloth quickly melted from the black cloth’s warmth. Nuts. Okay. That’s at least something. It’s good enough. I have a few moments left. Get a photo and then put the camera in the house and go to the day job. 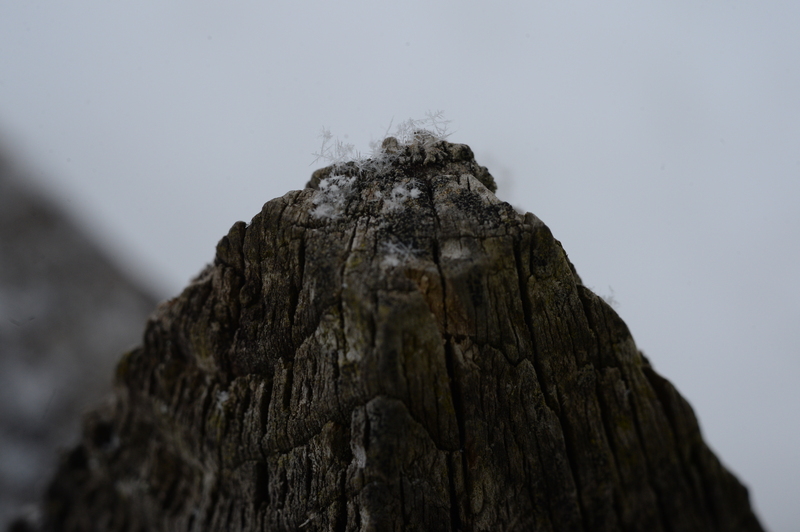 And it was at that point that I saw some snowflakes that had landed on my neighbor’s wooden fence post. Last night, after I had a chance to relax, I pulled my SD card out of the Nikon Df and went through the photos. 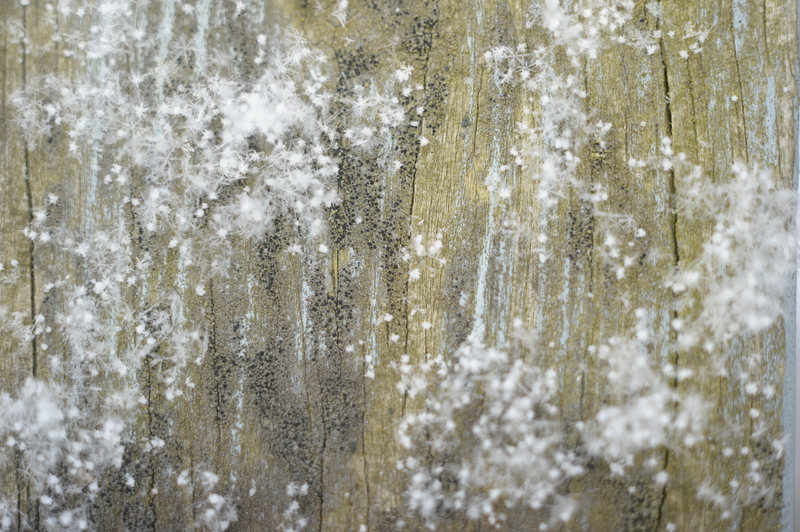 That last one … of the snowflakes on the fence post … was the best of the batch. Snowflake 2019. Nikon Df camera, Nikon 1:3.5 macro lens with ring flash. Photo (c) Chuck Miller, all rights reserved. I was able to enhance the lens to the point where there were big fat snowflakes with big pointy hexagon extensions, and they were hanging off the fence post like ninja throwing stars. I’ll have the specs and I’ll be ready. And I’ll make sure to leave a black velvet cloth outside for an hour or so before using it as a snowflake catch. And then … it dawned on me. This is the first photo I’ve taken with my Nikon Df in THREE MONTHS. Three months between eye surgeries.